Jimmie Rodgers, described by many as the Father of Country Music, had two other nicknames during his career: the Singing Brakeman, which referred to his work on trains, and America’s Blue Yodeler, which described one of his unique contributions to country music. Publicity photographs also portrayed Rodgers as a guitar-playing cowboy and as a sharply dressed man about town. These images help illustrate the range of Rodgers’s musical interests. James Charles Rodgers was born outside Meridian, Mississippi, on 8 September 1897. Since his father, Aaron Rodgers, worked on the Mobile and Ohio Railroad, Jimmie grew up traveling, especially after his mother, Eliza Rodgers, died when he was only five or six. From age fourteen until he was twenty-eight he worked, sometimes irregularly, as a brakeman or flagman on railroads, traveling through much of the South and Southwest. Always interested in making music, Rodgers decided to see if he could earn a living from it after he contracted tuberculosis and discovered that railroad work made it hard to breathe. In 1924 Rodgers started singing in vaudeville and medicine shows. In 1927 he first performed on the radio in Asheville, North Carolina, and recorded his first songs in Bristol, Virginia. Although he made records for only six years, Rodgers recorded more than one hundred songs. His songs were about three minutes long, and almost all featured Rodgers playing the guitar. Some had bands accompanying the singer, while others consisted entirely of Rodgers playing and singing. Part of Rodgers’s uniqueness lay in the variety of his music, and part lay in his appealing voice. While most of his records were marketed as country or hillbilly music, he learned a great deal from the styles of Tin Pan Alley, the blues, and jazz, and some of his songs included Hawaiian ukuleles. Rodgers’s most notable innovation was the blue yodel—blues songs in style and sound and lyrics with “yo-de-lay-hee-ho” between verses. He recorded thirteen blue yodels, and all are in the blues AAB format (saying a line twice and then following with a concluding line) and tell of trouble and sometimes violence between men and women. “T for Texas (Blue Yodel No. 1)” begins, “T for Texas, T for Tennessee / T for Texas, T for Tennessee / T for Thelma, that gal that made a wreck out of me.” Later Rodgers sings that he is “gonna shoot poor Thelma / Just to see her jump and fall.” Yodeling came from various sources—perhaps from cowboy songs or from the songs of travelers in the Swiss Alps—and Rodgers was not the first musician to yodel between verses of his songs, but he made it such a trademark that some people assume that country music always included yodeling. Rodgers helped write many of his songs, sometimes by reworking older songs and often by writing a tune while another writer supplied the words. Sometimes he modified popular musical styles, but sometimes he was clearly singing about himself, as when he sang, “I had to quit railroading / It didn’t agree at all.” In “Hobo’s Meditation,” he asked, “Will there be any freight trains in heaven?” And when he sang “TB Blues” and “My Time Ain’t Long,” both he and his audience knew he was singing about his own illness. Three themes dominated Rodgers’s songs. One was movement—sometimes leading back home, sometimes not. Second was a sentimental picture of home life. Love and longing for mothers and fathers were common, as in “Daddy and Home” and “Down the Old Road to Home.” Finally, he performed numerous songs about love that failed, whether because men or women left, because they cheated, or because they committed crimes and went to jail. Two features of Mississippi life were especially important for Rodgers in songs such as “Mississippi Moon” and “Mississippi Delta Blues.” First, working on trains gave him numerous stories about and insights into traveling people. He empathized with people on the move, in large part because he was one of them. This empathy was especially important during the Great Depression, when so many people had to travel in search of work. “Hobo’s Meditation” and other songs portrayed sad men riding the trains from the point of view of a sympathetic narrator. Second, as a Mississippian, Rodgers likely grew up hearing more African American music than most other early country musicians. Rodgers was extraordinarily popular during his short lifetime and remains popular with generations of music fans. 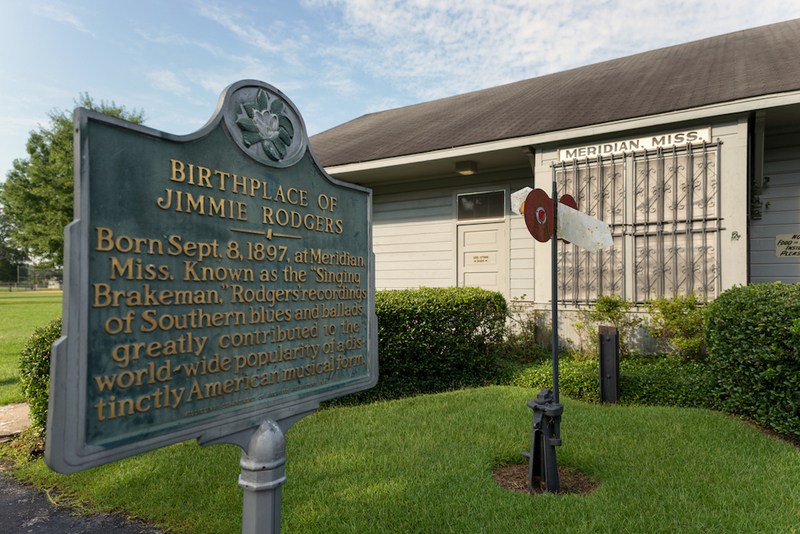 Numerous musicians have remade Rodgers’s songs, especially “T for Texas” and “In the Jailhouse Now.” He was the first performer inducted into the Country Music Hall of Fame in 1961, and in 1976 the Jimmie Rodgers Memorial Museum opened in his hometown of Meridian.